Th-INK-ing of You: Quick, Easy and Cherished... and a DOA computer. This week my computer bit the dust. I spent several days trying to get it fixed, and then finally bought a new laptop.It took hours to load everything up on this one, and I'm really bummed because I loved my old one and to tell the truth, I absolutely hate the keyboard on this new one! Half the time when I type the letters don't show up and I'm half afraid it's already having a problem! That said... if you see lots of typos from me.... blame that! LOL! I've never claimed to be a great typist, but THIS is ridiculous!!! LOL! Anyhoo...I have one more quick bookmark to share with you and I promise not to take much of your time with too many details! I made this using ODBD's Scripture Bookmarks (Ps 84:11).. I stamped with VersaFine on Prima Sunkiss dp. I cut this panel with the custom bookmark die made for ODBD by Spellbinders. I matted that with a piece of yellow Bazzill card stock. I cut the scroll out of the same yellow with an older Cuttlebug die, and I sponged everything with distress walnut stain ink. I cut the butterfly with a Cheery Lynn Exotic Butterfly Mini from a scrap of gold, then sponged with walnut stain to antique it a bit. I added the fibers and Recollections brad and that was it... super quick.... super easy.... but a nice little gift for someone who needs a lift. What better than a comforting Scripture! I am submitting this to Word Art Wednesday challenge- use their free verse/sentiment or any Scripture or encouraging sentiment. Thanks again for stopping by! I love knowing you were here! Computer troubles are a pain! Glad you have yours taken care of for a while--hopefully a LONG while! I love gifting books and this beautiful marker will be lovely with them. Thank you for showing it. Too gorgeous to be used as a bookmark... I'd frame this! Grace, on the older laptops you could attach a regular sized keyboard; perhaps you can do the same with the new ones? I am not computer savvy so perhaps it might be worth checking into? So gorgeous. Sorry you are having conputer problems. I am so sorry you are having computer problems. I feel your pain. I love this bookmark. You have made such a lovely job of it. Of course the scripture is a good one. Having just brought a new computer as well I know what you mean. My hubby Doug has a laptop and I don't like using it at all. I find the keyboard horrible too. You can plug in a regular keyboard if you like. what a stunning bookmark, Grace - love all the wee details and contrasts of texture and colour. I had a similar problem when I first bought this current laptop - turns out the mouse and the touch pad were having little hissy fits, and my SIL taught me how to disable the touch pad and I have had no more issues. 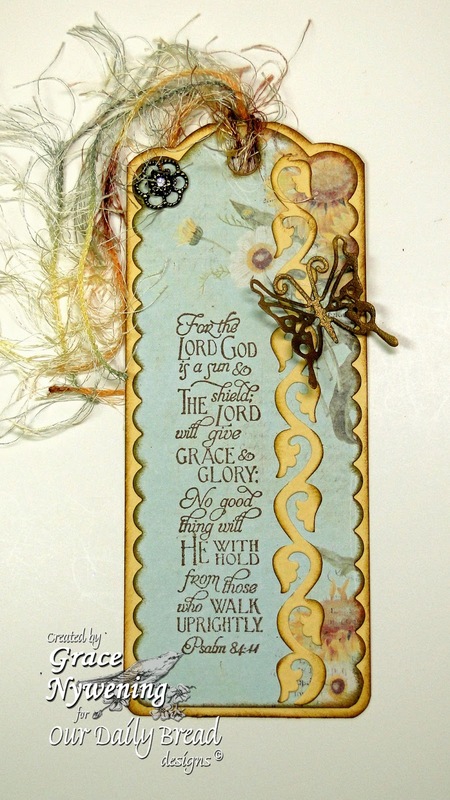 Grace: I know I've told you this before, but I am just IN LOVE with the ODB bookmark dies. They are SO beautiful. I'd like to own them all. Also, I noted on your profile that you've been married for 41+ years. My beloved and I just had our 27th anniversary yesterday, and I pray that God will give us as many (or more) as God has given you and your beloved. My marriage is one of the sweetest gifts God has given me. I look to women of God like you who inspire me to be a Godly wife. Thank you for inspiring me in so many ways. May God bless you in your marriage, your crafting, and life in general - you have blessed and inspired me SO much! Thanks for playing along at Word Art Wednesday. I so greatly appreciate your participation. Have a blessed week. Grace, sorry to hear about your computer, but I'm sure you'll get used to your laptop keyboard in no time. Love your bookmark!!! I was so happy to see the August ODBD release :) Thanks for sharing with us at Word Art Wednesday this week. This is beautiful Grace. Love the design. Your bookmark is gorgeous! Absolutely love it! It's telling me I need to start reading more! lovely bookmark, love the cuttlebug die down the side of the verse and I thought the butterfly was a metal embellishment, that die looks great!